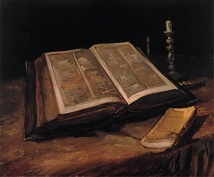 Remember Van Gogh’s 1885 painting Still-life with Bible? Here it is, number 117 in De la Faille’s catalogue. You can see the original in the Van Gogh Museum in Amsterdam. The Bible though it glows with authority is illegible. You can just see in this reproduction the while smudges that the artist used to create that effect. Meanwhile the novel, by Emile Zola, and clearly labelled La Joie de Vivre, waits to be read as the new gospel. The painting reflected Vincent’s tense relationship with his father, Pastor Johannes van Gogh. VvG had tried and failed to make the Christian mission his way of life, although not, according to his sister, without becoming ‘groggy on piety’. A turning-point was his rejection by the Church in Amsterdam on the grounds that his Latin was too poor. What do I need Latin and Greek for in order to help people? was the painter’s adequate reply. Emile Zola’s novel, one of many from this prodigious and highly readable French author, came out in 1884 and so was dernier cri when Vincent referenced it. It’s a nice thought, to read a work which the painter himself may have read. 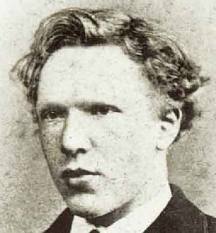 Van Gogh was a great fan of nineteenth-century novels. He loved Dickens and Victor Hugo, and of course he could read and write in three languages, English, French and Dutch. Zola is commonly labelled a naturalist in literature, a term which implies kitchen-sink detail added to the large and humane scope of realism. The appetites and what appeases them were his speciality. He was accused of being pornographic in his day. Le Ventre de Paris, (1873), meaning ‘The Stomach of Paris’ and translated into English as Fat and Thin, was set in the old market quarter of Les Halles, when the food stalls were still there (an epoch I just caught – I remember onion soup with stringy gruyère cheese dribbling down my chin at 5am, washed down by un coup de blanc). Le Ventre de Paris is written in prose that seethes and gurgles as foodstuffs slip and slide their way into human attention and ultimately human colons. It’s massively overfull, and you feel the discomfort as if it were your own. Its first English translator received a prison sentence for obscenity, and his unexpurgated edition wasn’t available until it was reprinted a few years ago, in more tolerant times. La Joie de Vivre is a typical nineteenth-century story of orphanhood, money troubles, and everyday greed and dishonesty. It’s a gentler read, though the pages recounting a young woman’s sexual frustration are startlingly honest. The action takes place in Bonneville, Normandy, beside a sea on which local people depend for their livelihood but which they can never bend to their will. The heroine Pauline, and she is indeed that, seems from the outset almost superhumanly charitable, but never unreal for that, and there are moments of pride and rage which put her goodness into perspective. She lives with her adoptive family, brings them happiness as well as the money her adoptive mother steals from her, and falls abortively in love with the son of the house, Lazare. It’s difficult to see how she can make her life elsewhere when Lazare’s mother has purloined her inheritance. Zola had a view of men and women which was morally realistic, one might say, and with his not very high expectations he was quite forgiving. Some critics say he could only create types, and that his creations don’t evoke sympathy, say, as Tolstoy’s great characters do. But then Tolstoy had an aesthetic of art as infectiousness, whereas for Zola the aim was a panoptic portrait of French life in the latter half of the twentieth century, now in Paris, now in the provinces, and across the different socio-economic classes. Although the individual lives of all his characters, even the minor ones, are vividly rendered, his overall achievement is to give his readers a taste of the Zeitgeist, which is especially interesting in retrospect. We get a feeling for the kind of struggles people were engaged in then, including what medicine could do for them, if it could do anything, and of the misery, and also sometimes the low cunning, sending their children to beg, of the poor. The physical pain and the dilemma of doctors is marked. There is an astonishing scene in La Joie de Vivre in which a doctor getting on in years, and whose main job in life had been doctor to the French Navy, sets about assisting in a difficult birth. He’s by no means confident he can save the life of either the mother or the baby, which is presenting feet-first, and has got stuck. Be prepared for fifteen minutes’ of agony, rendered in the minutest detail, as the operation proceeds without so much as a whiff of chloroform. What could van Gogh take from Zola, you might wonder? You can see it in the paintings of 1885-86, I think, which are still heavy and a bit gloomy with the detail of provincial interiors and where precisely joy is missing, because of the oppressiveness of religious piety. Van Gogh loves object-reality, though we’ve come mostly to love it in the later, brighter context of Paris and the south of France. Zola is a kind of companion humanist. In this link flagged up by Van Gogh painter and novelist have found a new way of sympathizing with human suffering, and a new way of seizing on the texture of lives which at the same time are often full of happiness and beauty. Zola, who was born in 1840, had a childhood that marked him in a positive sense. Read about it and you might think you were reading about the idealized boyhood of Rousseau’s Emile. (Did his mother have that eighteenth-century classic describing the perfect ‘natural’ upbringing in mind when she chose the name Emile for her own son?) Zola’s widowed mother left him more or less to run free, which he did with his companions in the countryside. One of those companions was Cézanne, whose worldwide fame as an artist would be even greater than Zola’s, and whose work would first be introduced to, say, the British and German publics through exhibitions in which his paintings were shown alongside van Gogh’s later work, all as examples of what Roger Fry called Post-Impressionism. The object-reality beloved of VvG is there in a cooler, more precise form in Cézanne. Zola, in his concentration on naturalistic detail, is part of the same vogue for what the philosopher Heidegger, in a more severe and definitely anti-bourgeois context would call our being-here, the way we occupy space and live in the company of other beings, animate and not. Zola, van Gogh and Cézanne stuck with the middle class that was their origin but they too were seized by this new, companionable materialism. In La Joie de Vivre Zola has Lazare flirt with reading the German pessimist Schopenhauer. Lazare’s reading is a kind of token of his defeat in business and in his studies, for which he was never cut out. A vague preoccupation with inherited degenerate traits sets up an interesting parallel here with Thomas Mann, whose Buddenbrooks The Decline of a Family would be published in Germany in 1901. The idea of biological degeneracy, discredited long since, was all the rage at the time. But Zola is no novelist-philosopher. His forte is the material life. The 1884 novel is terrifying on the human body (after reading it you’ll never want to get gout, or die of oedema, which is when your body swells up because your heart can’t pump fast enough any longer.) It’s charming on what it is to live with dogs and cats and food and weather, and other people’s bad moods. It is also full of superb natural description, of high seas, storms and the tranquil beauty of the summer coastline. It rattles and sways with the coming and going of carriages and when there’s no carriage, or the horse is old and tired, servants walk hours along storm-battered roads to fetch the doctor. This entry was posted in A Shoe Story - my next book, Art History, Writing and tagged Emile Zola, Naturalism in literature, Paul Cezanne, Thomas Mann, Vincent van Gogh. Bookmark the permalink.